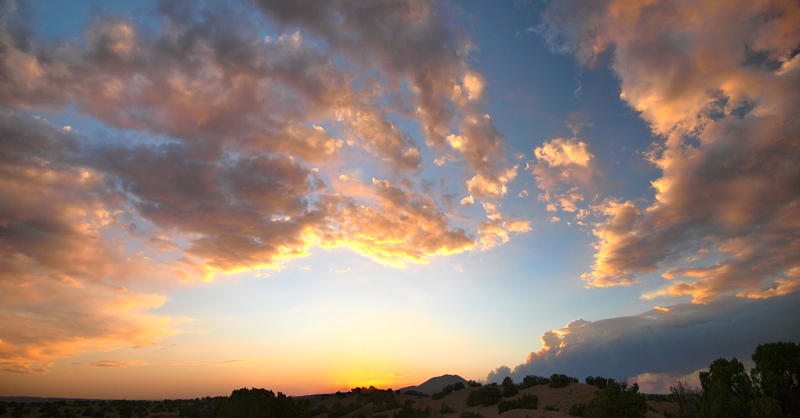 This afternoon a new fire started on my horizon, in the Jemez Mountains near Bandelier National Monument. By sunset, I could smell the smoke and see the flames from my place, at least 30 miles southeast of the blaze. As of nightfall the fire had already burned through Frijole Canyon in Bandelier, site of the park’s famous cliff cave dwellings and was approximately 12 miles southwest of the boundary of the Los Alamos National Laboratory. Voluntary evacuations had been issued for White Rock and Los Alamos and conditions were expected to worsen overnight. Fire is an important part of forest life cycles, but watching places you know and love go up in flames is wrenching. I’ve done a lot of hiking in this region of the Jemez and have visited Bandelier many times. Something tells me those cliff caves survived more than one fire in their hundreds of years of occupation. The forest will come back, greener than ever, but here’s hoping everybody in front of the flames gets out of the way with all that’s most important to them intact. This entry was posted in New Mexico, Uncategorized. Bookmark the permalink.